Posted by Dave Emory ⋅ February 19, 2018Post a comment Email This Post Print This Post Tweet This! COMMENT: For decades, we have pointed out the documented fact that much of the so-called progressive sector drools and slobbers over a great many obvious, heinous wolves-in-sheep’s clothing. One of those is former Attorney General of the United States Ramsey Clark, who continues to enjoy a reputation as a liberal/progressive icon. In addition to being a serial killer with some portentous blood on his hands, Clark helped spawn some of the worst abuses of the contemporary intelligence apparatus. In a useful volume titled The CIA as Organized Crime, author Douglas Valentine supplements analysis of Clark’s tenure as the country’s highest law enforcement official. 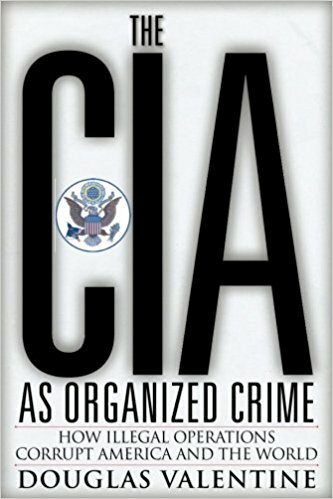 The CIA as Organized Crime by Douglas Valentine; Clarity Press [SC]; Copyright 2017 by Douglas Valentine; ISBN 978-0-9972870-2-8; pp. 158-159. Keep up the good work, Dave! While the “communitarian left” has often gone gaga about Ramsey Clark, the “old left” has taken the time to learn what he represents.